Jenna Ewing defends individuals and businesses in the healthcare industry. With a background that includes drafting pleadings, motions, and orders, as well as conducting depositions and working with expert witnesses, Jenna partners with her clients to ensure they are informed throughout the process. 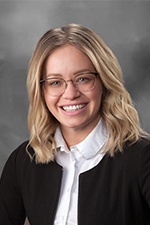 Jenna is also well-versed in alternative forms of dispute resolution, including settlement conferences, mediation, and arbitration; she is an arbitrator for the State of Illinois' 17th Judicial Circuit. Prior to joining Hinshaw, Jenna bolstered her medical malpractice litigation experience practicing with two other Illinois-based law firms. Jenna was also a legal intern at a boutique family law firm in Rockford, Illinois, where she later practiced following her completion of law school. While she was a student, Jenna was a Research Assistant for Professor Emeritus Jeffrey Parness.